Cheeky and loud, black and proud, Deadly Funny is Melbourne International Comedy Festival’s national comedy competition unearthing the freshest and funniest Aboriginal and Torres Strait Islander talent from across the country. Expressions of interest for Deadly Funny are now open! Click here for more info on registering for a workshop/to compete. Want to be apart of the audience? Deadly Funny National Grand Final & Showcase is on sale now! Expression of interest for Deadly Funny are now open. Click here to register your interest and make sure you follow us on Facebook to stay up to date with news and announcements. Workshop / heat dates are yet to be announced, so please indicate which city is your preference and we will be in touch shortly to confirm date, time and venue. Cheeky and loud, black and proud, Deadly Funny is Melbourne International Comedy Festival’s national comedy competition unearthing the freshest and funniest Aboriginal and Torres Strait Islander talent from across the country. Local heats have kicked off nationwide, and also feature a star-studded comedy line-up of Australia’s best Aboriginal and Torres Strait Islander comedians. Heading into its 14th year, Deadly Funny is a significant and vibrant part of the Melbourne International Comedy Festival. This one-of-a-kind comedy event is open to Aboriginal and Torres Strait Islander people aged 18 and over. To participate, all you have to do is have up to 5 minutes of funny material. It’s basically storytelling with a punchline! Entrants will take part in a private workshop with a professional comedian, followed by a public live performance. Special guest judges will decide who travels to Melbourne for the National Grand Final, where $2,000 is up for grabs! Acts should be 3-5 minutes max! 7pm show Redfern Community Centre (29-53 Hugo Street, Redfern) Tickets here. Congratulations to the 2019 Deadly Funny winner Fabian Woods from Western Australia! Watch the 2018 Deadly Funny National Final & Showcase on SBS On Demand. 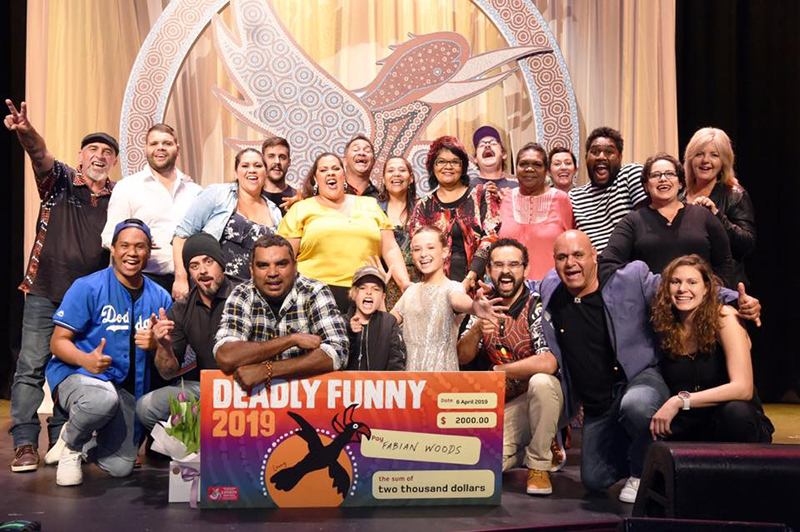 The 2019 Deadly Funny National Final & Showcase will be on NITV later in 2019. Interested in our comedy workshop program for Indigenous young people aged 12 to 18? Click here for more info on Deadly Funny Kids.